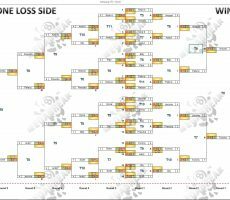 TUESDAY 10 BALL GRAND FINAL : TOMMY IS CHAMPION. 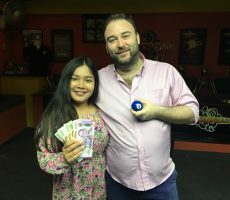 Congratulations go to Israel’s Tommy Fineman for winning our Tuesday 10 Ball Grand Final for Season 15 on Saturday night. 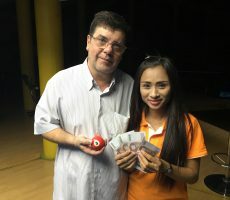 From the full entry of 16 players he defeated Vincent Coleman from Ireland in the final by 4 racks to 2 (race 4-6) to collect the 1st Prize of 10,000 baht. 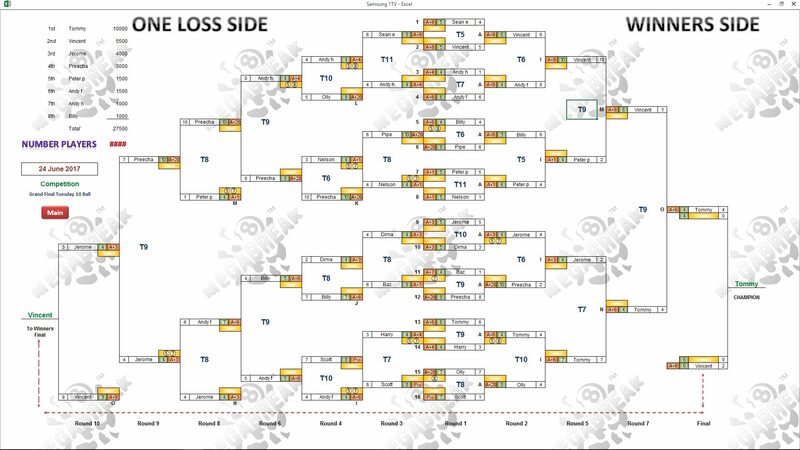 Tommy played very well to remain undefeated all night long, winning four matches to qualify for the final through the Winners Side of the draw, before beating Vincent to lift the trophy. He had his work cut out earlier on in the evening though, as in his very first match he trailed Harry Arefjell from Norway by 3 racks to 1 (race 6-4), before winning five consecutive racks to win in the deciding rack. From then on things were more straightforward, as none of his other opponents managed to reach the “hill”, and he ended up a worthy winner. 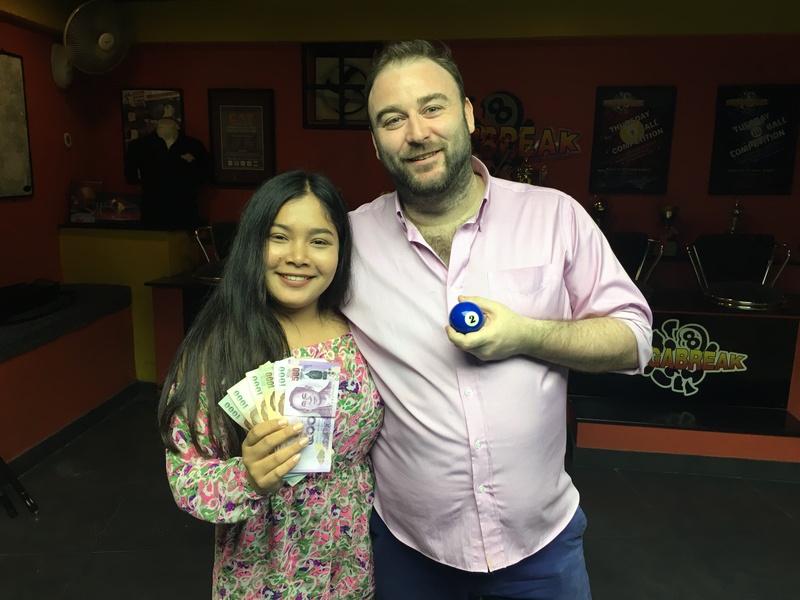 Vincent also played well to reach the final, only losing to Tommy twice on the evening, and took home 5500 baht in 2nd Place. Eccentric Frenchman Jerome Pierron was next, finishing in 3rd Place receiving 4000 baht, closely followed by Thailand’s Preecha, who collected 3000 baht in 4th. 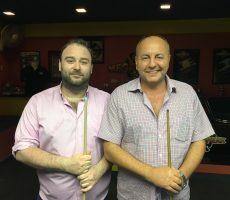 In Equal 5th Place were Andy Featherstone from Hong Kong and Peter Pellack from The USA, each taking home 1500 baht, and the other money winners on the night were two Englishmen, Billy Hayes and Andy Hall, who each received 1000 baht in Equal 7th place. 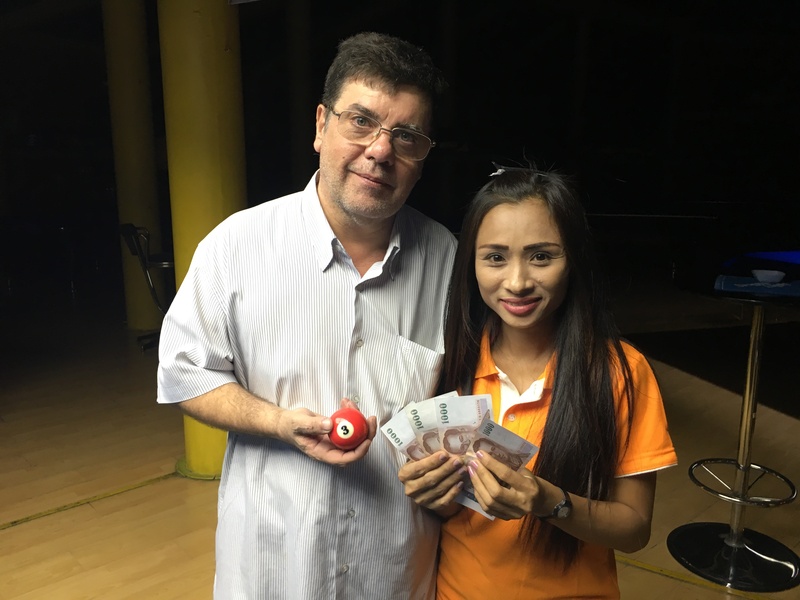 Winner : Tommy Fineman (A+6) – 10000 baht. Runner-Up : Vincent Coleman (A+8) – 5500 baht. 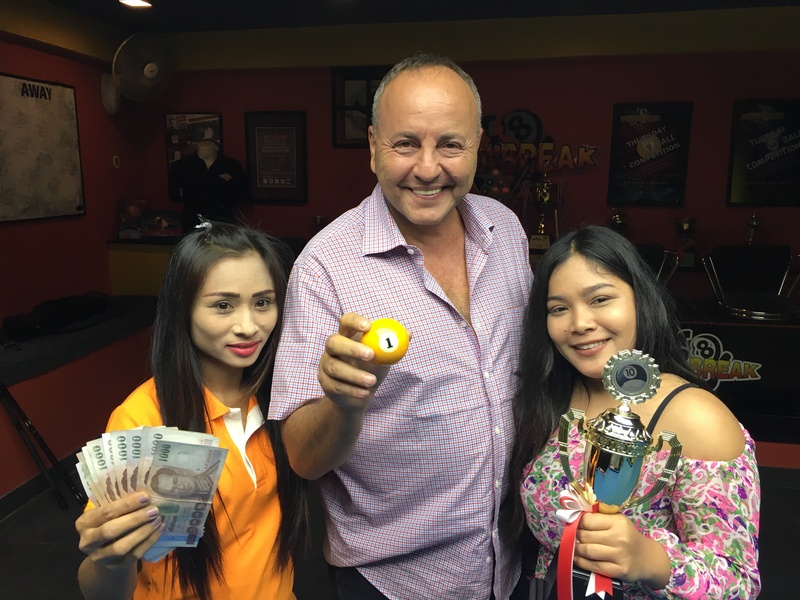 3rd Place : Jerome Pierron (A+3) – 4000 baht. 4th Place : Preecha (A+20) – 3000 baht. Equal 5th Place : Andy Featherstone (A+6) and Peter Pellack (A+1) – 1500 baht each. 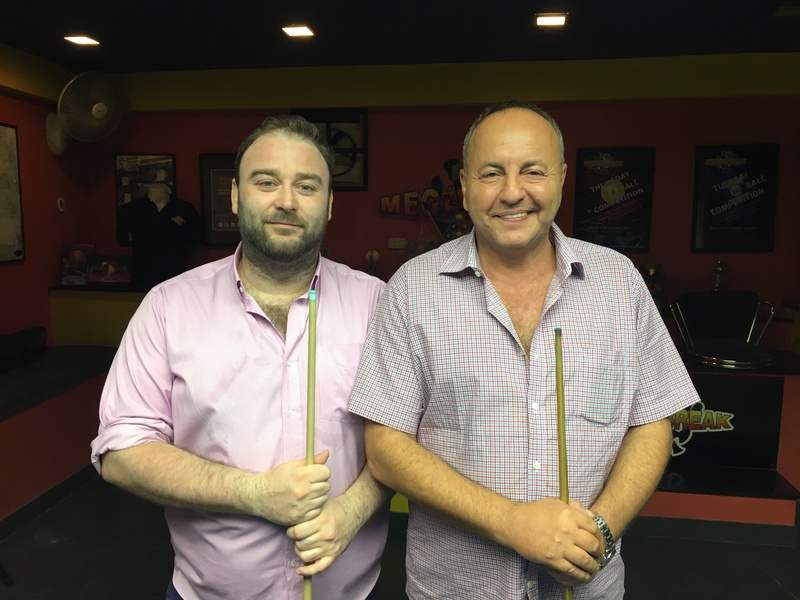 Equal 7th Place : Billy Hayes (A+6) and Andy Hall (A+4) – 1000 baht each. The Calcutta Auction once again provided massive interest, with a Total Prize Fund of 10600 baht being created. Tommy bought himself for 700 baht, putting an extra 4200 baht in his pocket. 1st (40%) : Tommy Fineman (Himself) – 4200 baht. 2nd (30%) : Olly Downey (Vincent) – 3100 baht. 3rd (20%) : Albert Gringhuis (Jerome) – 2100 baht. 4th (10%) : Harry Arefjell (Preecha) – 1200 baht.